Official Website for Leslie Castle Scotland. 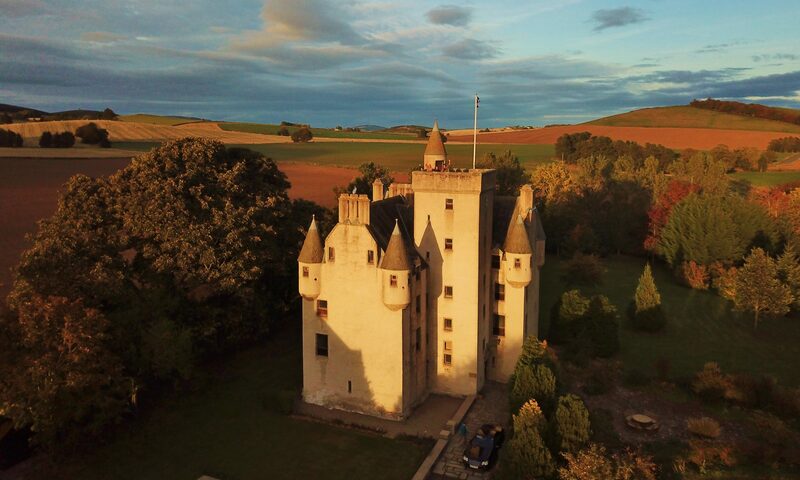 Imagine the unique experience of a real historic Scottish Castle, hosted by the Baron of Leslie and family, perfect for dreamers, history buffs and international travellers wishing to explore Scottish culture. We offer accommodation in the historic castle on a bed and breakfast basis. Evening meals are also available to guests in the Baronial hall by prior arrangement. Book direct on our website for the best rates and take advantage of our Spring Special offers; 3 nights for the price of 2 or Dine for Free before 1st July . Then start counting down the days! The Castle may also be used for events, such as intimate weddings, anniversaries and corporate functions. Leslie Castle is owned by the Baron of Leslie. It dates back to the 14th Century, the present structure was built in 1661 and underwent major restoration in the 1980’s when the comforts of modern day life were introduced. We continue with upgrades and maintenance of the Castle so as to keep it in good condition for our guests. The Castle has 6 large en-suite rooms to accommodate guests. We invite you to relax in and enjoy the Great Hall; the cosy fireside sofas of the Withdrawing room and superb views of the garden; or snuggle up in our Baron’s Retreat with a book or game from our shelves, or plan a day out from the comfort of a fire side seat. The Old Kitchen with its vaulted ceiling and huge fireplace is now where we serve a freshly prepared full cooked breakfast. Breakfast is prearranged at a time to suit you, usually between 8am and 10am. We use the finest local produce where possible. Cereals, pastries, fruit, yogurt and juices are available on a buffet and you can request porridge for a traditional alternative. Surrounded by rolling hills which are perfect for walking, hiking, fishing, golfing, nordic skiing or just relaxing near the castle. We are close to the Whisky Trail and to the Castle Trail, giving guests the opportunity to visit a plethora of places. Explore ancient castles or visit Royal Castles. Follow the whisky from cooperage to distilleries. There is something for everyone with a history spanning thousands of years from the age of flint to recumbent stone circles, to ancient hill forts, to the Romans and Pictish tribes. With over 300 castles, stately homes and ruins dotting its landscape, Aberdeenshire is unsurprisingly known as ‘Scotland’s Castle Country’. We are also a convenient stayover for those touring between Edinburgh/Glasgow and Inverness/Skye. For the Leslie clan-folk there are particular local visitor sites to see, they can visits the Leslie Cross at the chapel of Garioch, the ruins of Balquhain Castle, the Battle of Harlaw Monument as well as the Leslie Kirkyard. The News section / blog is regularly updated with snippets of history and things to do and see in the area. We also display a variety of leaflets in the Old Kitchen to inspire guests who use them to plan their days. All guests staying at the Leslie Castle are offered a guided tour of the Castle and information about the Castle’s history and restoration. The Castle is also open to the public for tours by prior arrangement, a small fee is payable for not resident guests. We welcome enquiries from schools and club visits.